I skipped Challenge Roundup last month. I had other posts planned, and let's face it, my challenges were abysmal. I did much better in February. I'm flying along with The 3rd Canadian Books Challenge. In January, I read one book: Generation A, but in February I read 4. The most in one month yet! the four books were Grow Great Grub, I Never Liked You, The New Moon's Arms and Fish for Dinner. That brings me up to 10 out of 13 books read. For the All About the Brontes Challenge, I've read 2 of my 4 picks: The Life of Charlotte Bronte and a graphic novel version of Jane Eyre. I have Agnes Grey for my online book club for March, so I'll have at least 3 read by the end of next month. I've completed the Graphics Novel Challenge. I picked the entry level reader which required 3 books. I've read Jane Eyre, I Never Liked You and The Adventures of Blanche. That was a fun challenge. I'll continue playing along with it even though I'm finished. Other than reading The Custom of the Country for the Women Unbound Challenge back in January, I haven't read anything else. I will pick up the pace for that one in March. So not too shabby. I'm thinking of joining another challenge: The Classics Challenge. It's one I can handle. How about you? 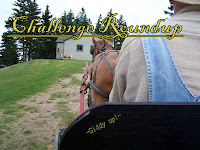 Write your own Challenge Roundup post and leave a link in the comments.